Recycle items and help the Cross Timbers Group raise money! If you’re tired of not being able to recycle toothpaste containers, drink and soap refill pouches; make-up, shampoo, conditioner, and other personal care containers; energy bar wrappers; and pet food pouches, then look no further! You can collect those items and drop them off, or mail them in to the Terra Cycle company and choose the Cross Timbers Sierra Club as the charity that you want a small portion of the recycling returns to benefit. You can drop the items off at a location, or print off a free mail slip and mail the items to Terra Cycle! 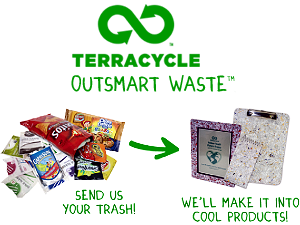 You can also create an account at http://www.terracycle.com and choose the Cross Timbers Sierra Club for the donation recipient! It’s that easy! We’re currently working with local businesses on securing locations for drop boxes to be placed in Denton, Collin, Grayson, and Fannin counties. We’ll post those locations as soon as they’re secured and ready to go!